Today is the 1st day of our four day break exploring the coast north of Brisbane. 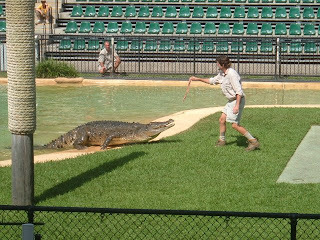 We stopped at the Zoo home of the late crocodile hunter Steve Irwin. Love him or hate him you can't get away from seeing him posted all over the Zoo, the Zoo is a must see stop when visiting Queensland. We were primarily interested in visiting the Animal Hospital next to the Zoo after reading a story about it in a magazine. For $35 you can get a 2hr visit behind the scenes of what is the biggest animal hospital in the world. The hospital had only just opened in November and everything lots spick and span and had more in common with a human hospital than the usual vetinary surgery. It has 2 fulltime vets and literally hundreds of volunteers/animal carers which support it. 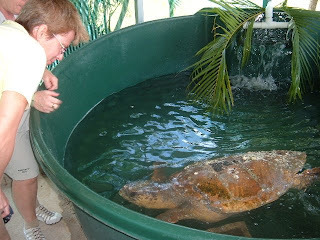 It can cope with upto 100 sick and injured koalas and lots of other animals such as kangaroos, birds, turtles, etc. 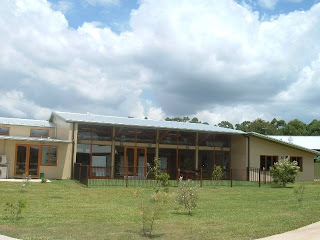 Steve Irwin's mother was a animal rescuer/carer but she died in a car accident in 2000 before she got to see the setup of the 1st animal hospital in a converted shed. 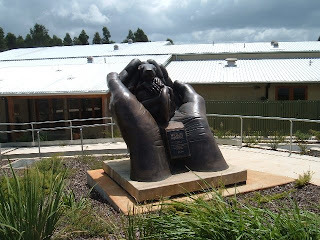 Steve Irwin vowed to build a full facility in his mother's memory but also he never got to see it come to fruition. His wife Terry is putting all the stops out to expand the Zoo to twice its present size in the next five years. The Zoo is very impressive, very clean and focused on education/awareness. Its one of the best layout for a small Zoo which we have come across. 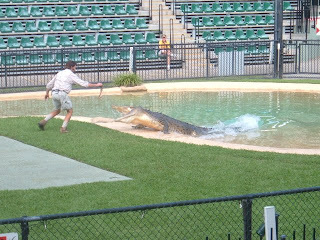 A must see was the croc show in the arena, feeding the crocs at arms length...not for the faint hearted.